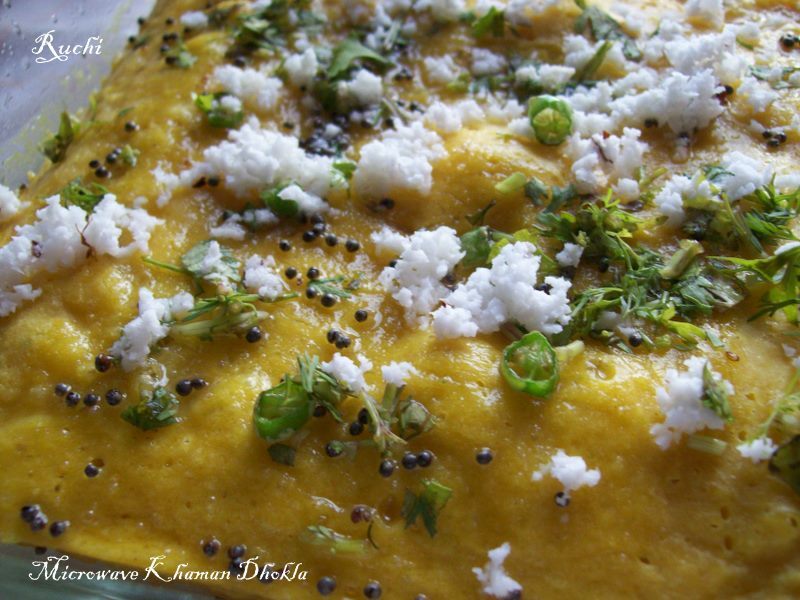 Khaman Dhokla is a traditional Gujarati savory Snack which is steamed and the dal batter is made from bengal gram flour or Besan infused with a sugar-lime juice solution to give it that authentic street taste and it is tempered with a mustard seeds, curry leaves and little flavored oil. Out of the many varieties of dhokla, Besan dhokla is the easiest to prepare at home and it tastes simply great. I made this dhokla in Microwave .It comes out soft and it tastes simply great. In our home everyone loves dhoklas. 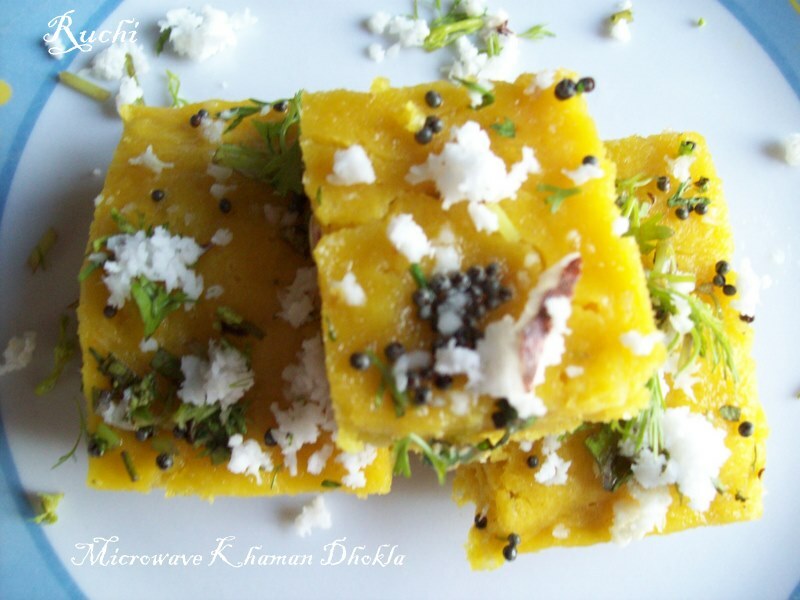 Instant microwave dhokla is really an instant and delicious snack. 1.Grease a glass tray & keep it aside.In another bowl mix besan,curd,salt,lime juice,sugar,grated ginger & green chillies. and add water little by little, mixing with other hand so as to prepare lump free batter. 2.Let the batter rest for 20 minutes, covered. In a small bowl, take lemon juice and add 1 tsp oil to it. 3.Add eno fruit salt and mix quickly to this batter and mix it well & pour it immediately in the greased tray.Microwave it for 3 minutes. Insert a tooth pick to check it’s done. 4.Microwave on HIGH for 2 minutes or until the surface no longer looks very wet. Let the bowl stand for 2 more minutes. 5.At this time, the dhokla cake will leave the sides of the bowl. Invert onto a serving dish. Meanwhile, prepare the tempering. Heat 1 tbsp oil, then add mustard seeds, green chilly &pinch of asafetida. 6. Take the tempering off the heat, stir in 2 tbsp minced cilantro and pour the tempering mixture over the dhokla. Very interesting one.. looks tempting !! 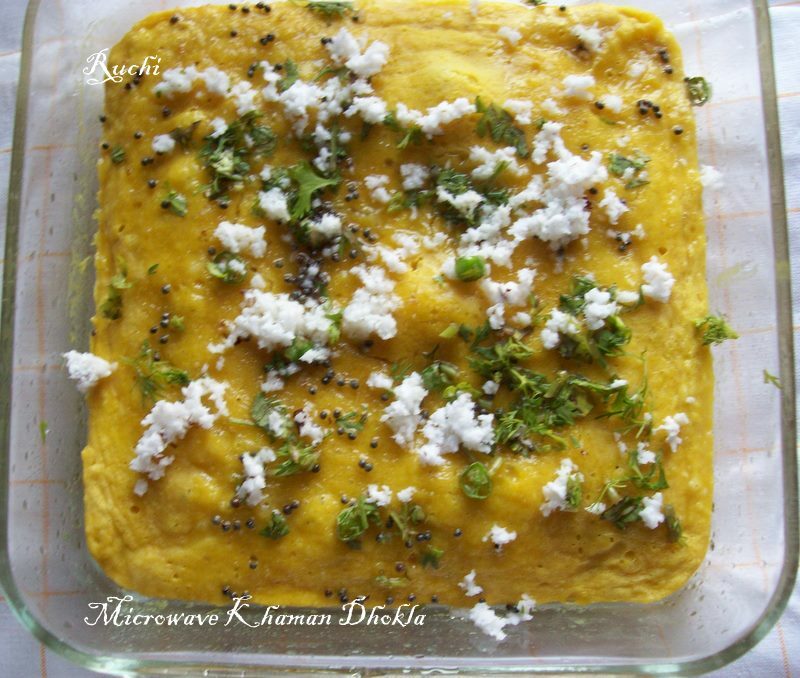 Dhoklas turned out super prefect, love it anytime..
Thats a cool way! Look very nice!